After doing a ton of research on this subject the decision is really split. There are as many arguments for towing with propane on as there are towing with propane off. Why would one want the refrigerator running while they’re towing? Simple, so when they pull over at a rest area, they can have lunch in their RV with cold drinks, cold lunch meat, ice, etc. A pretty good reason if you ask me. Since we’re newbie’s the first time we towed, we decided to tow with the propane off. We put the refrigerator on high the night before so it would be nice and cold when we cut power. We cut power, hooked up, and headed out. If you haven’t read our other posts, we were going from Pigeon Forge, TN to Brunswick, GA. A trip that should’ve taken about 8 hours actually took about 10 hours. 10 hours later, we arrive at our destination. We did stop for lunch at a Pilot, but didn’t get into the fridge because we had let our food supplies run low since we were moving. I was pleasantly surprised to find the fridge still nice an cold when we arrived in Brunswick. 10 hours without power, without propane and the ice was still frozen. I’m guessing even on the 10 hour trip, we could’ve open the fridge to get out whatever we needed to have lunch and everything would’ve still been fine when we arrived in Brunswick. In the end, it’s really going to boil down to a personal preference, but I like to err on the side of safety. I realize the propane system on an RV is very safe, but if an accident were to happen while towing and propane line gets busted open, that could really spell disaster. 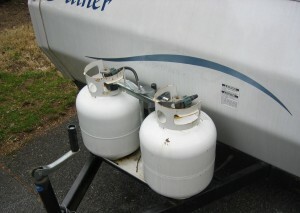 And now that we know the fridge will stay cold even on long trips, there’s no need to tow with the propane on. Prior to August 28th, 2012 we had never spent the night in a camper or RV. Now we're full timers and have never looked back. If you've ever dreamed of doing the RV thing, do it. It's much easier than I ever imagined. The only thing I regret so far is not doing it sooner.